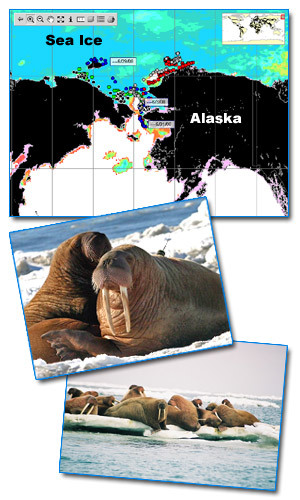 USGS Studies the Impact of Global Climate Change on Walruses in the Arctic! Dr. Jay and his team at the USGS Alaska Science Center are studying walrus movements in the Chukchi Sea, northwest of Alaska. The researchers are interested in where the animals go and what the impacts of climate change are on walruses and other marine mammals that need the ice to survive. The scientists have found that over the past few years, sea ice in the Arctic is not covering as great an area in the summer as it used to. The sea ice, large areas of which are called 'pack ice' is very important to walruses. The animals rest, or 'haul out' on the sea ice and dive into the icy waters to feed. In general, walruses tend to stay in waters above the continental shelf. This is because these mammals dive to the bottom to eat invertebrates such as clams and worms. Pack ice moves north, retreats, in the summer as temperatures warm. The satellite tagging work shows that some of the walruses are not staying with the pack ice. Instead, they are using chunks of ice that remain over the continental shelf area. This was new information that researchers learned by using the satellite tags. Dr. Jay explains, "We didn't realize the degree to which [the walruses] were using dispersed ice in summertime." He is also concerned about this because, "There will probably be a point when the ice melts more quickly in the future." For example, last year, when even the chunks of ice over the continental shelf melted, some of the walruses were forced to haul out on the shore. The shore is not a normal habitat for females and their young; they have access to much more food and habitat when they remain on the pack ice. Therefore, scientists are interested to see how the retreating ice will affect walruses and other animals including polar bears and ice seals. It is likely that other parts of the food chain will also be affected. Dr. Jay explains that it is important for students to understand that Global Climate Change is happening now. "We are seeing very dramatic changes in sea ice in the Arctic and walruses are one of a good number of species that we are trying to understand." The next challenges will be to try to discover what the changes mean for walruses and the entire Arctic food web.